BPMN processes created in the BPM Suite can be monitored by standardized dashboard in the BPM workspace. Besides that there a default views to export Oracle BPM metrics to a data warehouse. And there is another option: BAM – Business Activity Monitoring. BAM takes the monitoring of BPMN processes one step further. BAM allows you to create more advanced dashboards and even real-time alerts. BAM enables you to make decisions based on real-time information gathered from your running processes. With BPMN processes you can use the standard Business Indicators that the BPM Suite offers you and use them to with BAM without much extra effort. 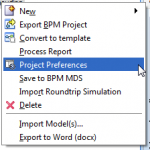 However you have to enable BAM in BPM processes. When you run a process that has Oracle BAM enabled the BPMN Service Engine populates Oracle BAM database with information about the business indicators measured in that process. The BPMN Service Engine generates this information based on the Sampling Points preference you defined in your project. Also read the blog post on how to configure your SOA server to know where your BAM server is running. This is also needed to use BAM for BPM metrics. 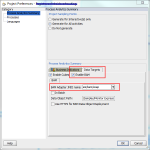 This entry was posted in BPA, BPM, Oracle, SOA Suite, Tools and tagged BAM, BPM, Fusion Middleware, JDeveloper, metrics on 2012/08/22 by PeterPaul.